New Zealand Facts: Location, Population, Etc. Location. New Zealand lies southeast of Australia between latitudes 34 degrees south and 47 degrees south. Area. New Zealand is 1600 kilometers north to south with an area of 268,000 sqr km. It comprises two major islands: the North Island (115,000 sqr km) and the South Island (151,000 sqr km), and a number of small islands. Population. In September 2010, New Zealand had an estimated a population of close to 4.3 million. According to Statistics New Zealand, the country's estimated population growth is one birth every 8 minutes and 13 seconds, one death every 16 minutes and 33 seconds, and a net migration gain of one New Zealand resident every 25 minutes and 49 seconds. Climate. New Zealand has what is known as a maritime climate, as opposed to the continental climate of larger land masses. Climate and weather conditions in the seas around New Zealand can cause climatic volatility. Rain is more evenly distributed in the North Island than in the South. Rivers. The Waikato River in the North Island is the longest New Zealand river at 425km. The longest navigable river is the Whanganui, also in the North Island. Flag. See New Zealand flag. Major cities. New Zealand's largest cities are Auckland and Wellington in the North Island, Christchurch and Dunedin in the South Island. 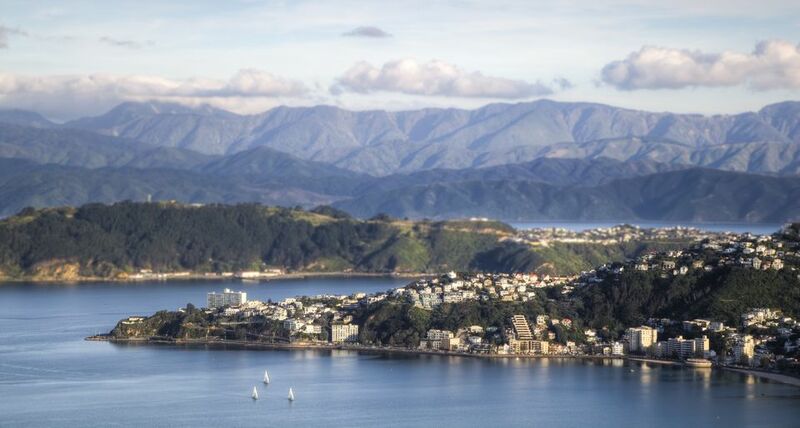 Wellington is the national capital and Queenstown in the South Island calls itself the Adventure Capital of the World. Government. New Zealand is a constitutional monarchy with the Queen of England as head of state. The New Zealand Parliament is a unicameral body without an Upper House. Travel Requirements. You need a valid passport to visit New Zealand but may not need a visa. Five-day Tours. If you have limited time, here are some suggestions for visiting the North Island or South Island. Money. The monetary unit is the New Zealand dollar which is equal to 100 New Zealand cents. Currently, the New Zealand dollar has a lower value than the US dollar. Note that the exchange rate fluctuates. First inhabitants. New Zealand's first inhabitants are believed to be the Maori although it had also been hypothesized that the first Polynesians to inhabit what is now New Zealand arrived around 800 AD and were the Moriori, or moa hunters. (The moa is a species of birds, now extinct, some of whom were as tall as three meters.) The hypothesis that the Moriori were the first to arrive in New Zealand appears to have been disproved by Maori oral history. The Moriori and the Maori belong to the same Polynesian race. European exploration. In 1642 Dutch explorer Abel van Tasman sailed up the west coast of the place he named Nieuw Zeeland, after the Netherlands province of Zeeland. Cook's voyages. Captain James Cook sailed around New Zealand on three separate voyages, the first in 1769. Captain Cook gave names to a number of New Zealand places which are still in use. First settlers. The first settlers were sealers, then missionaries. The Europeans started arriving in greater numbers in the early 19th century. Treaty of Waitangi. This treaty signed in 1840 ceded sovereignty over New Zealand to the Queen of England and guaranteed Maori possession of their own land. The treaty was written in English and in Maori. Women's right to vote. New Zealand gave its women the right to vote in 1893, a quarter century before Britain or the US. How Do You Make an International Call to and From New Zealand?